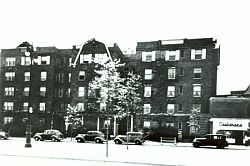 "The Kew Bolmer (80-45 Kew Gardens Road) was designed in 1914 for the acute angled intersection of Queens Boulevard and Kew Gardens Road at the edge of the new community. 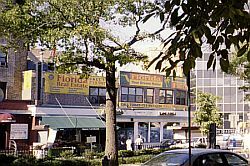 Like the nearby Kew Gardens Inn that would go up six years later, the Kew Bolmer must have been sited to take advantage of the rural views looking east over the Queens Valley (Flushing Meadows) as well as the Boulevard's new trolley line that ran via the Queensborough Bridge into "the city." 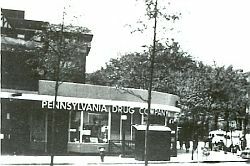 handsomely designed to fit the triangular site, it had balconies facing west, a picturesque cornice to delight those traveling east on the Boulevard, and surrounding gardens that are today buried under commercial store fronts." My name is Bill Grimmel. I lived in Kew Gardens from 1947-1987. I was baptised in and was a member of the congregation of the First Church of Kew Gardens. I was married there too. I attended PS 99 from '53-'59, RSJHS from '59-'61, RHHS from '61-'64, Queens College from '64 on. I lived at 117-14 Union T'P'Ke - The Kew Terrace Apartments. I appear in several of the PS 99 class photos. I now live in Seattle, Wa. I'd be happy to correspond with anyone that knew me or that have questions about Kew Gardens. Editor's Note: Thanks to Ed Feige and Marion Schild for the attached photograph of a mini-reunion held in December 2004. Click on the thumbnail to enlarge the image. PLEASE tell me what is going on with construction at the Regents Row Pub. It's looking awfully like the new occupants have destroyed the facade -- and am getting the terrible feeling that yet another part of Kew Gardens has been tossed away. Why isn't the association doing something about this? In general, I see trees being cut down -- without replacement, new stores on Lefferts Blvd. that are only pulling the neighborhood down (the 99 cent store). It's all really outrageous. We should be preserving and restoring -- and it doesn't look that way to me. I commend the Bliss Cafe and Ascend for their aesthetically pleasing appearance, valuable service to the community and quality service. Editor's Note: Signs posted at the site indicate that the old Regent's Row is being converted into two stores. The inside has apparently been gutted and renovated, so not a trace remains of the old restaurant. The loss of the frescoes painted on the interior walls of the old Regent's Row is sad. I do not know what businesses might occupy those stores, but I will try to find out and give you an update. As to the Kew Gardens Civic Association, there probably isn't much it can do. The building is not designated an historic landmark, so the owner is free by law to alter it as he sees fit as long as the final result complies with the zoning laws, which notices posted at the site indicate it will. So, because it is private property, the Association has no way to stop the renovations or to veto what businesses might lease store space there or anywhere else in the community. 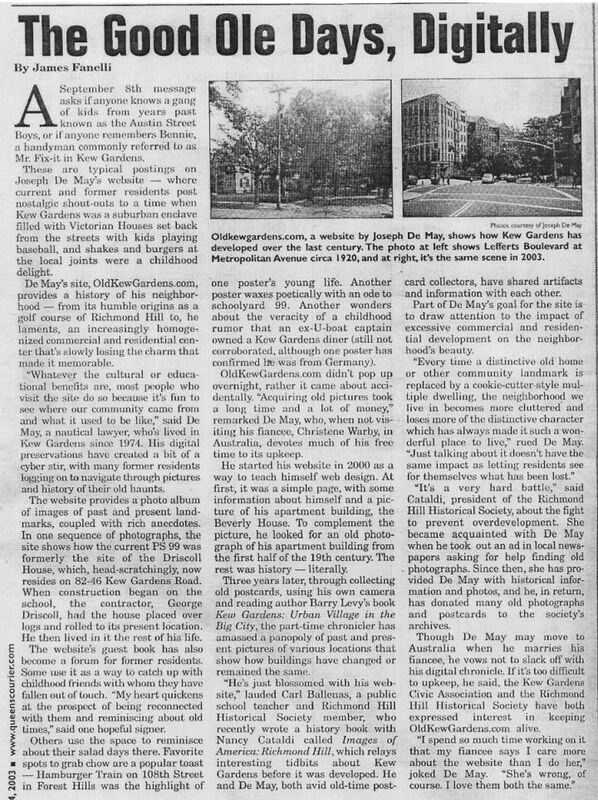 04/20/05 Update: The Civic Association's best information is that the site of the old Regent's Row will become a pizzeria. If true, it's an odd choice of tenants considering that Dani's House of Pizza is just across the street. Gary, at Linda's Organic Kitchen & Market, said he would like to celebrate the 35th "earth day" at the health foods store at 81-22 Lefferts Boulevard between Grenfell and Austin Streets. We are having another poetry and music evening. The event is scheduled for Friday, April 22nd at 8:00 P.M. Everyone is invited to attend. If you'd like to perform, please contact me. Thanks for an informative and great-looking site. I had gotten the address from a mail message sent to me by Joe, who was answering a query of mine about war memorials. Thanks for everything. My name is Gus I have been living in KG since 1978 at the Mowbray. I never graduated from PS 99 since I am an immigrant from Argentina, but a US citizens since 1986. However I taught at PS 99 for few years at the night school the course of Travel and Tourism. I do not mind to have my e-mail published. I found the site today searching for pictures of KG to sent to a friend. I also found Barry Lewis book inspiring and very well documented. It made excellent reading during the winter. While I was reading it I thought of the idea of having a flag for the "Urban Village " A civic flag for the residents and businessmen of KG. A flag of no political and religious significance but to be proudly hoisted by all its resident as a show of belonging. I leave you with that thought and I will love to hear your comments of the subject. For those Kew Gardeners who went to Russell Sage Junior High School during 68-70 it is with great sorrow that I have to tell you that Leslie Braunstein passed away this past week while living in Florida. Editor's Note: Because I have been receiving so much spam, I have had to change the way messages are posted to the guestbook and "Where Are They Now?" pages. Instead of online forms (which could be submitted anonymously), all messages will have to be submitted by email. The fastest way to do that is to go to the Email Me page and click on the appropriate email link under the headings "Guestbook" or "Where Are They Now? A blank email page will open with the subject and categories of information. Here is a picture of Ronnie Leiser, Gary Mayer and Michael Gruenberg in Forest Park in 1950. Editor's Note: The Real Estate Section of yesterday's New York Newsday newspaper featured a Kew Gardens house as "Home of the Week". Click on the thumbnail to view an scan of the article [102 KB]. The house is located on the south side of Abingdon Road between 83rd Avenue and Lefferts Boulevard. 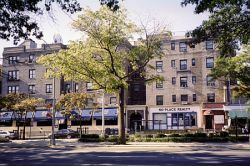 Editor's Note: The latest edition of The Queens Chronicle newspaper reports the closing and possible razing of the Chatillon Scale Factory on Kew Gardens Road east of Lefferts Boulevard. Click on the link below to read the story online. The link will open in a new window. Close out the window to return here. I went to PS 99, Russell Sage Junior High School, and Richmond Hill High School graduating in 1962. I would like to get in touch with KittyPick De Chiara , Roberta Marcus, and any one else looking for some one that went to school during the time I did. On the school pictures from PS 99 ( 6-1 MRS. Mahon Teacher l956 )(4-2 MRS. Fuller 1954) I recognized more people ,and some of the names that were printed were wrong. The site is Great. Thank you For having it. Editor's Note: Beginning today, I will post a photograph of some Kew Gardens location which will change twice a week. Each image will have a higher resolution and be more than 2-1/2 times the size of the other images I have on the site. Most of the pictures will be ones I have taken over the past 4 years. Some will be old photographs already published elsewhere on OKG, but the higher resolution will let you see the image in much greater detail. For now, I'll call them "Featured Photographs". (I'm not happy with that name, but I can't think of anything else. If anyone has any ideas, I'm open to suggestions.) The Featured Photograph can be accessed either from the home page or from the most current guestbook page (see above). Just wanterd to say hi there to all those I went to school and enjoyed my childhood with....PS-99(63-69) and Sage (69-72)...and apologize to all those I pulled over when I was captain of the saftey patrol in 6th grade. I was very pleased and nostalgic to look at our class picture and see how great everyone looked in the reunion photos these many years later. I'm living in Springfield, Missouri and would really enjoy knowing how my old schoolmates have been doing. I can be contacted through this website's e-mail address. The northwest view of Lefferts is from a photo taken in June 1970. The original proprietors Alfred and Jesse Bauer sold the market in 1952 to Edgar (Eddie) Wolfermann and my father, Karl Lehmann, who ran the business in partnership with Harry Hess until the early 1980s. One of at least five butcher shops in Kew Gardens at the time, Bauer's was known for its fine meats, wurst and barbequed chickens. Bauer's also served as a congenial place to trade stories and quips of local interest. Some of the profits from the shop were well spent and occasionally used to buy me deluxe stickball bats at the Wonderland toy store on Metropolitan Ave.